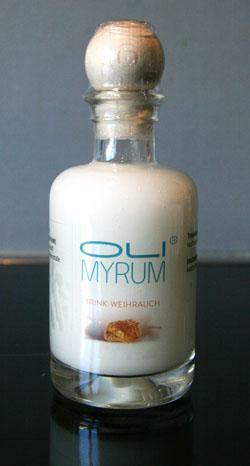 Olimyrum® Frankincense Elixir is a natural elixir on the basis of frankincense and ginger. The drink enhances well-being and has an influence on the gastrointestinal tract. The liquid frankincense is free of estragole *, and free from chemical-synthetic fragrances, coloring and preservatives. Ginger enhances the effectiveness of the frankincense. Ginger with candy sugar balances the bitter taste of the frankincense, making it more palatable. The drink is aromatic and provides the balsamic aroma of the frankincense. Frankincense extract and frankincense hydrosol also act as a natural preservation of the beverage. After opening, the contents should be consumed within 2-3 weeks, observing the suggested dosage. Olimyrum® frankincense elixir can be taken daily (about one tablespoon per day). Olimyrum® frankincense elixir aids digestion and prevents stomach discomfort.